The Claire Friedlander Family Foundation, in partnership with The Corporate Source, a Garden City-based nonprofit that creates employment opportunities for individuals with disabilities, honored James Denson, a paralegal with disabilities who helps disabled clients with their Social Security benefit appeals, with the 2nd Annual National Disabilities Employment Awareness Month (NDEAM) Champion Award. 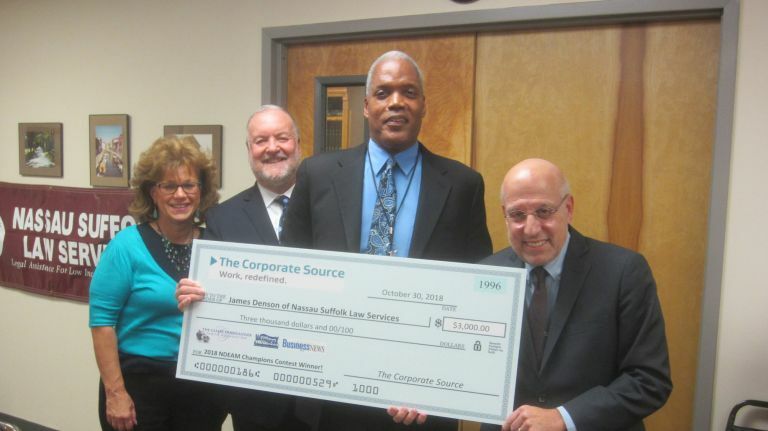 Recognizing the contributions of people with disabilities in the workforce, The Corporate Source invited prominent Long Island businesses to nominate an employee with a disability who they believed should be chosen as a NDEAM Champion among Long Island employers. Denson, a Hempstead resident, who has cerebral palsy and overcame stuttering, was nominated for the distinction by Jeffrey Seigel, executive director of Nassau Suffolk Law Services, where Denson has worked for 27 years. Seigel praised his devotion to the work he does with clients, some of whom have psychiatric impairments. “The Claire Friedlander Family Foundation supports the work of the work of The Corporate Source for providing dignity through employment opportunities to those who might otherwise be marginalized for a disability,” said foundation President Peter J. Klein.